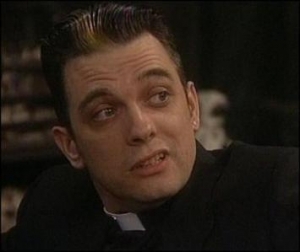 About twenty years ago I played the part of Father Damo in Father Ted. Father Damo was to Father Dougal the kind of bad influence you try to keep your son or daughter away from but they will inevitably gravitate towards. Father Damo wore an earring, smoked and stole and told his superiors they were, “not the boss of me”. I was on the Father Ted set in County Clare for about three days and spent five days in London rehearsing and one evening shooting in front of a live audience. Little did I know that twenty years later Father Ted is still the biggest influence on my professional life. At least five times a day I will get people coming up to me saying, “Who do you prefer, Oasis or Blur?” I don’t even think about it anymore. I am Father Damo to most people and that’s fine with me. People ask me if I get annoyed considering I have done six years on the RTE sitcom Killinaskully with Pat Shortt, performed stand up all over the world for the last twenty years and acted in TV3’s Red Rock, BBC’s Roy and countless films but the one thing I get recognised for is one episode of Father Ted. I am not at all annoyed. I am proud that Father Damo is still remembered. I am proud to be part of the phenomenon that is Father Ted. Father Ted is now being watched by people who weren’t even alive when it first came out and although there are many one off characters featured in the entire series, Father Damo is one that sticks out. I love Father Ted myself. When I got the part of Father Damo and read the script I broke my shite laughing (not literally). Most scripts are hard to get through but the writing of Arthur Mathews and Graham Linehan was brilliant and meant the part was easy to play. Ardal O’ Hanlon as Father Dougal was brilliant to work with. I felt we hit it off really well on screen. The football scene under the credits was totally ad libbed. I tour on a regular basis now with Patrick McDonnell (Eoin McLove) and Michael Redmond (Father Stone) from Father Ted and all over the country we meet people who just adore Father Ted. I know I am proud of lots of work I have done over the last twenty years and before that but Father Damo is the part that I’ll be remembered for and I’m happy with that.